You're out! Patrick Brown of Market Deeping clean bowls Bourne's Archie Stroud. Photo: David Lowndes. Suggestions that Outgang Road has become a retirement home for the old and the infirm appear to have been premature. The recent signing of local legend Ajaz Akhtar meant that Market Deeping, while they might lack agility and mobility in the field, were not going to lack age and experience for the rest of this summer. Akhtar, Deeping captain David Gillett and opening batsman Chris Jones are three wise men with around 80 years of local knowledge between them, but, crucially, they have young and gifted cricketers alongside them ready to listen and learn. And two of those teenage talents delivered the best individual displays of today’s (June 6) win over neighbours Bourne, a result that should stiffen the belief that Deeping have a decent chance of landing their first Lincs Premier Division title. Certainly on this evidence they have a better chance of finishing top than reigning champions Bourne. Both sides missed a fast bowling presence in Tom Andrews (Deeping) and Colin Cheer (Bourne), but the home side could still field 16 year-old Patrick Brown, a speedy seamer whose silky run-up and classical action have already earnt him a place in the Worcestershire Academy. Brown claimed two Strouds in his first spell before picking up the Lincs minor counties wicket-keeper Carl Wilson (courtesy of an outstanding slip catch by Ali Sharp) for a team top score of 33 and two tail-enders in returnung figures of 5-53 from 14 overs. Bourne were dismissed for 194 which should have bee a disappointment for them as they faced a fielding side with three limpers, Sharp and Gillett who picked up their injuries on the day and Akhtar who has refused to bend down when fielding for the last decade. But Bourne are not renowned for working the ball around. They kept taking on Gillett’s well-placed field and kept failing as Brown pouched the best two players at deepish mid-on off the bowling of Emile Kriek and in-form Rob Bentley tamely chipped the same bowler to cover point. Kriek finished with 3-33 purely by bowling with discipline and accuracy. It could have been worse for Bourne as Louth (28) was badly missed off the bowling of Akhtar before he’d reached double figures. He was dropped by Jamie Morgan, a player wearing such shockingly pink boots it was impossible to hide his embarrassment. 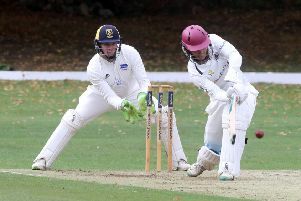 Former Cambs minor counties captain captain Akhtar would have appreciated some help as he looked rusty and bowled many ‘four’ balls, but there were also enough quality deliveries to suggest that he will make a strong impact as the season wears on. Akhtar and Brown were responsible for several of the 25 wides conceded by Deeping (there is a strict interpretation of the leg-side wide rule in this competition), but Bourne’s lack of quality bowling on a free-scoring ground was always likely to be costly. Martin Shillito did dismiss Jones with the first ball of the Deeping innings, but Akhtar and Alex Wheatley, Deeping’s other gifted teenager, put on 112 for the second wicket simply by despatching the majority of the bad deliveries they faced, and there were plenty of them. Akhtar’s departure to a caught behind decision that didn’t please him did prompt a mini-collapse of four wickets for just 16 runs which also included Wheatley’s disappointing dismissal and a run-out while backing up of Kriek which also didn’t endear the umpiries to the home players, but Gillett’s class outweighed the discomfort of a sore hip and he found a useful ally in Dave Sargeant to steer his side home with no further alarm with a partnership of 68. Deeping also moved above Bourne in the table into third place which ought to give the men from Abbey Lawns much to ponder. Reining in their natural batting aggression until bowlers and fielders are more tired would be a good starting point and developing more appropriate sledging topics might be another. Accusing Akhtar of a lack of ‘loyalty’ would work better if he hadn’t spent 28 years in the Peterborough Town first team. Bowling: P. Brown 13-1-53-5; A. Sharp 2.1-0-8-0; A. Akhtar 10-0-60-0; E. Kriek 11-1-33-3; M. Adatia 11.3-3-32-2. Bowling: M. Shillito 7-0-22-1; J. Berry 6-0-26-0; T. Bentley 6-0-33-0; T. Dixon 13-2-62-2; B. Stroud 12.3-4-44-1. Spalding claimed a second win in three matches, but it wasn’t quite enough for them to climb off the bottom of the table. It was a thrilling success at Skegness though as Spalding won by just two runs after the home side lost their last three wickets to Dan Milgate (4-18) for just 14 runs. Nuwan Jayasena also took four wickets after Luke Hollingworth’s 53 helped push Spalding up to 213 all out. Spalding 213 (L. Hollingworth 53, W. Nel 38, B. Smith 29, R. Ambrose 22, N. Jayasena 21, B. Young 5-43). Skegness 211 (B. Young 48, D. Milgate 4-18, N. Jayasena 4-85).